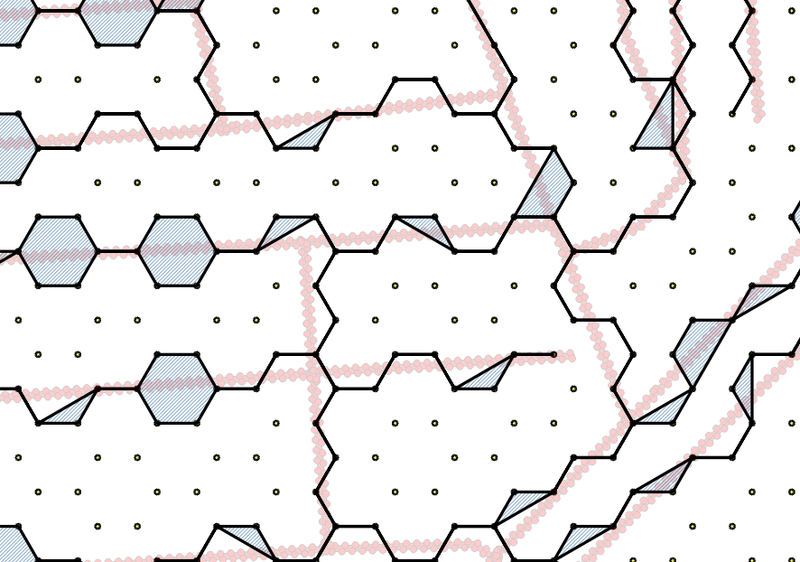 I'm trying to use QGIS 2.14 to snap a road network to a hexagonal grid, but I'm getting strange artifacts. The reason for the buffer is that Snap geometries doesn't let you snap to a layer whose geometry is different. For example, you can't snap nodes on a LINE layer to points on a POINT layer). It seems to be happiest snapping POLYGON to POLYGON. I suspect the roads expand out when one side of the buffered road line jumps to one side of the hex cell, and the other side jumps to the other side of the hex cell. In my example, the roads which cross west-east at an acute angle seem to be the worst. buffering the road network by a tiny amount, so it remains a polygon but is very thin. I find that if I change to using just LINE layers, It works for a while, then crashes. It seems to save its work as it goes - some lines have been partially processed. 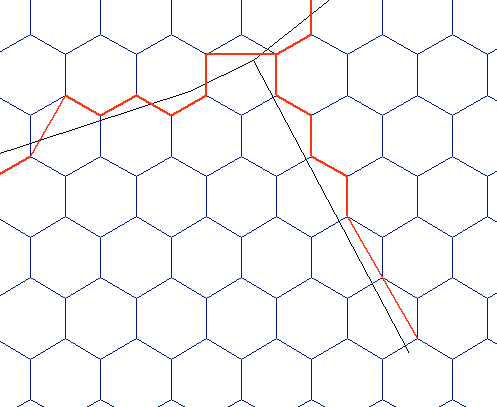 Does anyone know of any other way to snap points on a line to the nearest point on another line/polygon layer, ideally without needing to use postgres/postgis (although a solution with postgis would be welcome too)? For anyone who'd like to have a go, I've put a starter QGIS project here on Dropbox. 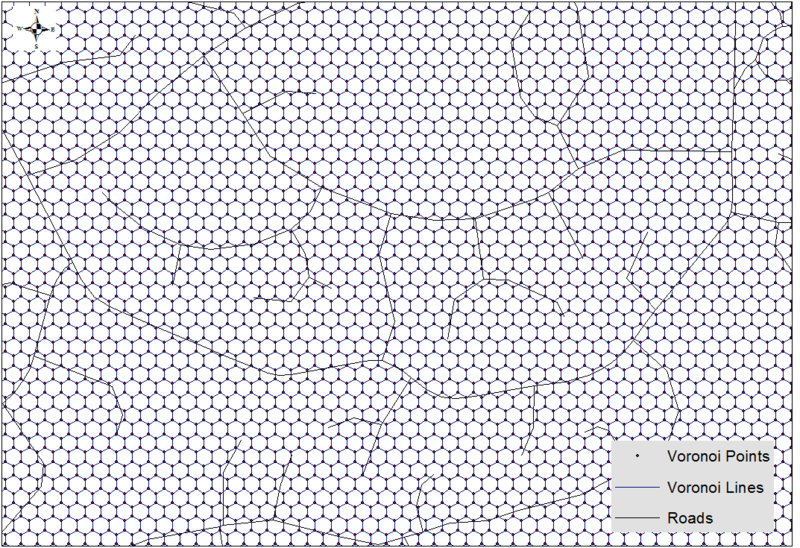 This includes the Hex Grid and Densified lines layers. (The road network is from OSM, so can be downloaded using QuickOSM e.g. if you need to get the original to undensify the roads). Note that it's in OSGB (epsg:27700) which a localised UTM for the UK, with units in meters. You can run the following code snippets in sequence from within QGIS (in the QGIS Python console). At the end you get a memory layer with the snapped routes loaded into QGIS. 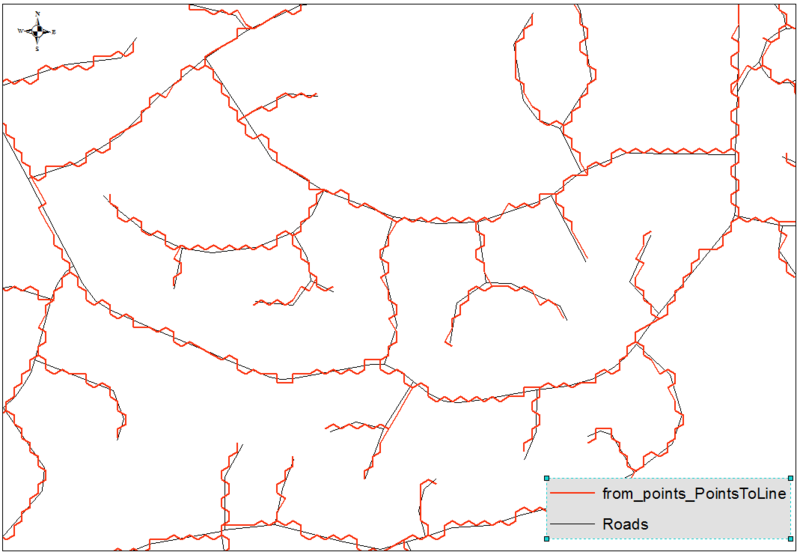 The only prerequisite is to create a multipart road Shapefile (use Processing->Singleparts to multipart, I used the field fictitiuos as Unique ID field parameter). This will give us a roads_multipart.shp file with a single feature. 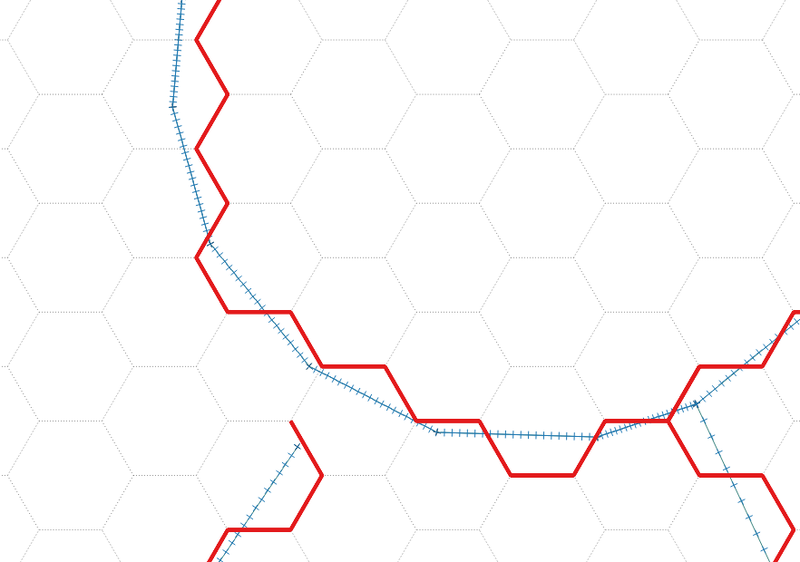 Get the nearest hexagon sides where routes cross. For each hexagon we create 6 triangles between each pair of neighbour vertices and the corresponding centroid. If any road intersects a triangle, the segment shared by the hexagon and the triangle is added to the final snapped route. This is the heavier part of the whole algorithm, it takes 35 seconds running on my machine. 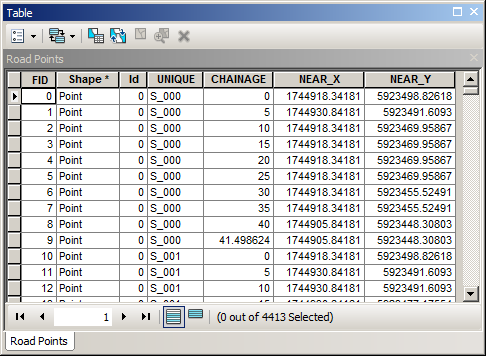 In the first two lines there are 2 Shapefile paths, you should adjust them to fit your own file paths. 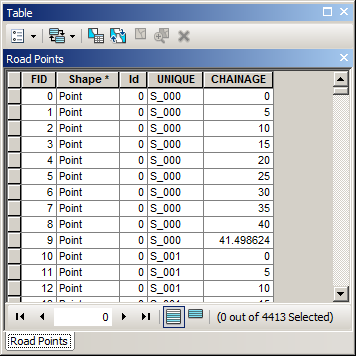 roads = QgsVectorLayer("/docs/borrar/hex_grid_question/layers/roads_multipart.shp", "roads", "ogr")  # Must be multipart! # Only append new lines, we don't want duplicates!!! Get rid of disconnected (or 'open') segments by using Python lists, tuples, and dictionaries. At this point, there are some disconnected segments left, i.e., segments that have one vertex disconnected but the other one connected to at least other 2 segments (see red segments in the next figure). We need to get rid of them. Should you need attributes in the snapped routes, we could use a Spatial Index to rapidly evaluate intersections (such as in https://gis.stackexchange.com/a/130440/4972 ), but that's another story. I did it in ArcGIS, surely can be implemented using QGIS or simply python with package capable of reading geometries. Make sure that roads represent network, i.e. intersect each other at the ends only. You are dealing with OSM, I suppose it is the case. 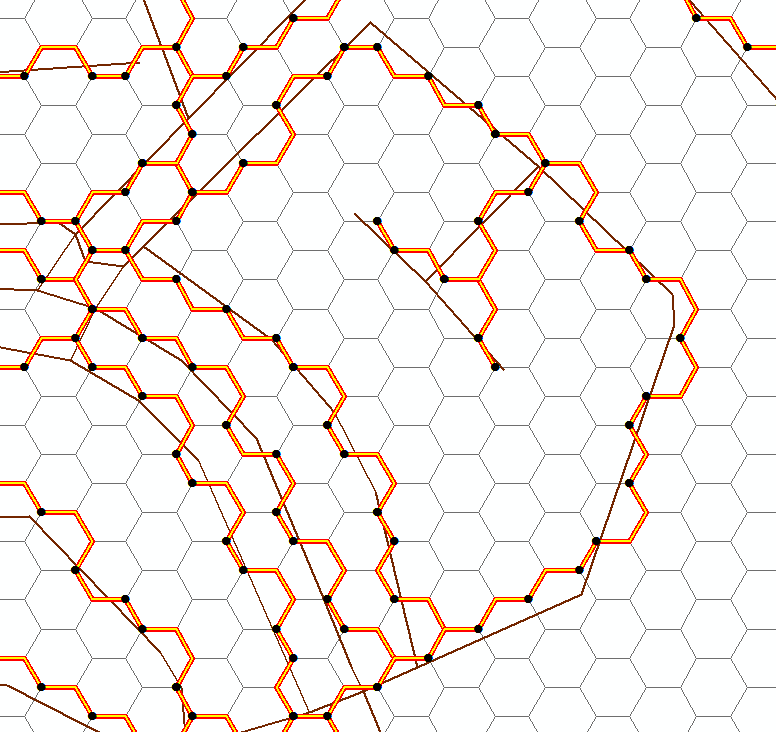 Convert proximity polygons to lines and planarise them, so they become a geometric network as well. This script contains many loops within loops and a nested cursor. There is definitely room for optimization. I ran through your datasets in a couple minutes, but more features will compound the issue. If you were to split the road line into segments where each segment was completely contained by the hexagon, your decision on which hexagon line segments to use would be whether the distance from the split road segment's centroid to each hexagon side's midpoint was less than half the diameter of the hexagon (or less than the radius of a circle that fits inside the hexagon). 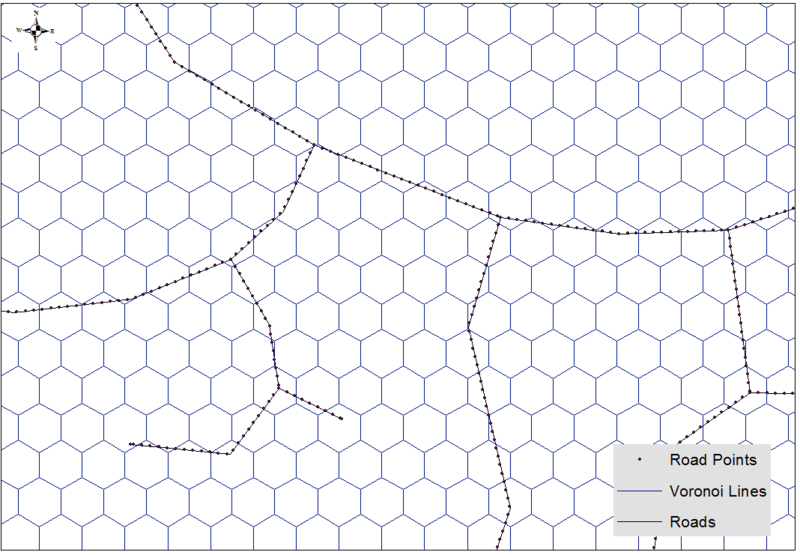 Thus, if you were to (one segment at a time) select hexagon line segments (where each segment is a side of the hexagon) that are within a distance of the radius of the hexagon, you could copy those line geometries and merge them on whatever unique identifier you use for your road dataset. If you have trouble merging on the unique identifier, you could apply the buffer and select by location on only those segments to apply the attributes of your road dataset; that way you wouldn't have to worry about making false matches with a buffer that is too large. The problem with the snap tool is that it snaps points indiscriminately; it's difficult to find that perfect tolerance to use. With this methodology you would be correctly identifying which hexagon line segments to use, then replacing the geometry of your road data (or inserting the geometries into a different dataset). 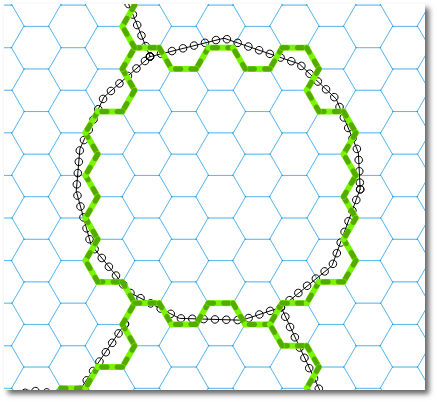 Also, if you still have the issue with the line segments that jump from one side of the hexagon to the other, you could split the line into segments by vertices, calculate the length of each line, then remove any line segments that are larger than the average length of one side of the hexagon. The geometry snapper in qgis 3.0 has been reworked and now allows snapping between different geometry types. It also has lots of fixes. You could try a "daily snapshot" version to get access to the improved snapper before 3.0 is officially released. Not the answer you're looking for? Browse other questions tagged qgis pyqgis geometry snapping hexagonal-grid or ask your own question. How to efficiently access the features returned by QgsSpatialIndex? How to implement a “Snap to Road”-functionality? Automatically snapping points to line ends on two separate layers?